After more than a decade working as a professional photographer in Ottawa, Mitchell Burton moved across the country, enrolled at Okanagan College and traded in his camera for a welding torch. Today marks another important step toward that new career path as he and hundreds of others – from Aircraft Maintenance Engineers to RV Service Technicians – earn credentials at the College’s Trades Commencement ceremony. The answer to that question inspired Burton to get in his car and drive west across Canada to move to the Okanagan to pursue a new career path. An avid scuba diver, Burton was intrigued by the possibility of becoming a commercial level diver. Upon further research, he decided to explore a trade closely associated with commercial diving – welding – which led him to Okanagan College. For Burton, today’s ceremony marks the completion of his C-Level Welding Foundation Certificate which he hopes will propel him into the industry and open the door to future training. Burton’s next step will be to accrue the 1,000 hours of industry experience required to earn his Level 1 apprenticeship, after which he plans to return to the College to obtain B-Level Certification. More than 700 apprentices and foundation trades students will have received credentials since January. About 100 of those students were expected to attend Thursday’s ceremony. Trades Commencement is one of eight convocation and commencement ceremonies Okanagan College will host this year. By the end of June, the College will have sent more than 2,000 graduates into the world to become nurses, engineering technologists, business leaders, computer programmers, educators, tradespeople and more. Okanagan College is the second-largest trades training institution in the province behind BCIT. podium in this weekend’s provincial Skills Canada competition in Abbotsford and solidified a spot in the National competition in June. to bring home to the Okanagan. Each year, the Skills Canada competition congregates secondary and post-secondary students and apprentices from across British Columbia to participate in a series of challenges distinct to each of the 47 different disciplines in the competition. Pfob returned to Skills Canada's provincials this year to win his fourth overall medal in carpentry and his second consecutive gold medal. He will be continuing onto nationals in June for his second year in a row. McLaren was surprised to be brandishing the gold medal at the end of the day, worried that he had stumbled on a couple of the six stations in the Automotive Service event, but was happy to come out on top. Mclaren’s classmate, Levi Nicholas, also placed in the event, joining McLaren on the podium with a silver medal in the same category. and led him to gold. Like the other gold medalists, he will be continuing onto Nationals taking place in Edmonton in June. Steve Moores, the Okanagan College Dean of Trades and Apprenticeships, is proud of the OC’s commitment to its students, but doesn’t allow that to detract from the impressive accomplishments of their students. Along with the three gold medalists, OC brought home silver in both Heavy Equipment Service (Kian Banner) and Aerospace Technology (Levi Nicholas) as well as bronze in IT Network Systems (Frank Van Zandwijk), Refrigeration (Adam Sohnchen) and Culinary Arts (Siobhan Detkavich). On April 13, 27 students from School District 23 visited the OC Trades department to participate in an exciting project. Supervised by Marvin Rode, Department Chair for Construction Trades at OC, the students helped cut planks from raw logs with a portable saw mill. The planks, donated by Gord Wilson and Chuck Cullen from Team Construction, will be used to build planters for the City of West Kelowna and the new Trades Centre at the Vernon campus. James Ross, a Trades and Technology Teacher Education alumnus brought his Grade 8 and 9 Tech Ed students from Glenrosa Middle School. Claus Gerlach, a SD 23 teacher and College trades instructor, brought his Trades Sampler students from the SD 23 Trades and Tech Centre to work together on this project. Gerlach and the students participated in hand-sawing contests while the students took turns on the saw mill. A leading Western Canada company is giving a surge to trades students at Okanagan College. A class of Residential Construction students from the Penticton campus spent the last few weeks at the En'owkin Centre, working on everything from flooring to painting, among other projects, as part of a major summer renovation to the centre. Tag Savage is one of 11 students who have had a chance to put their construction skills to the test on the project, under the tutelage of instructor Rose Simpson. Savage, who hails from Summerland brings two years of property finishing and renovations training, along with roofing experience, to the newfound knowledge and s he’s picked up since stepping into the program in February. The class also built multi-purpose sheds for the property. They have now wrapped up their work at the Centre and will complete the program in Mid-August. Three Okanagan College Trades students each earned bronze medals at the Skills Canada National Competition (SCNC) held in Winnipeg from May 31 – June 3. Brendan Battersby took home the bronze in the IT Network Admin competition. Battersby graduated from the Network and Telecommunications Engineering Technology (NTEN) program at the College’s Spring Convocation Ceremony in Kelowna earlier this month. He is employed by iTel Networks Inc. Pictured with coach Ron Light, NTEN program instructor at Okanagan College. Congratulations to medal winners at the Skills Canada National Competition, as covered in the Penticton Herald and Kelowna Now. Kelowna-Lake Country MP Stephen Fuhr, representing the Honourable Navdeep Bains, Minister of Innovation, Science and Economic Development announced today a $332,485 investment from the Federal Government in a new trades training house at the Kelowna campus of Okanagan College. Construction is expected to begin in Spring 2017 on the new 2,700 square foot facility that will provide hands-on, practical training opportunities for more than 300 students per year for programs including carpentry, electrical, plumbing and piping, steamfitter/gasfitter, residential construction, and sheet metal worker. Upholding the College's commitment to sustainability, the project will incorporate the latest green building technologies, techniques and materials, including an extensive solar photovoltaic array on the roof to capture energy, along with a system for collecting and reusing rainwater. The project will cost $867,000 and is being funded through $332,485 support from the Government of Canada and investment by Okanagan College, donors and industry partners. The project is expected to complete in Fall 2017. The Government of Canada funding for the infrastructure project is being allocated through the Post-Secondary Institutions Strategic Investment Fund, which will enhance and modernize facilities on Canadian campuses and improve the environmental sustainability of these facilities. A total of $2 billion has been allocated to accelerate infrastructure at Canadian colleges and universities over the next three years. OC was the best in the province in the areas of Automotive Collision Repair, Automotive Service, Carpentry and IT. Brendan Battersby, a second-year student in the College’s Network and Telecommunications Engineering Technology (NTEN) program won gold in IT – Network Systems Administration. Kurt Breton, a level 4 apprentice earned gold in Automotive Service, while Lukas Pfob, also a level 4 apprentice, took the top spot in Carpentry. Andreas Roth, a level 3 apprentice, won gold in Automotive Collision Repair – a category swept by OC. Roth was joined on the podium by Caleb Loewen who brought home the silver medal and Marcel Kaemmerzell, who earned bronze. Roth and his fellow Collision Repair competitors were evaluated on their skills across a variety of tasks, including welding, plastic and metal repair, and damage analysis over the six-and-a-half hour competition. Collision Repair instructor Danny Marques said while preparation plays a big role in students’ success, it is their ability to perform under pressure that is the determining factor on competition day. Overall, Okanagan College students captured a dozen medals at the competition, which was held on April 5 at The Fraser Valley Trade & Exhibition Centre in Abbotsford. Other institutions that took part included Vancouver Island University, BCIT, Kwantlen Polytechnic University, Camosun College, Northern Lights College, University of the Fraser Valley, Riverside College, Thompson Rivers University and Vancouver Community College. Gold medalists earn a berth to the National Skills Canada competition on May 31-June 3 in Winnipeg. The national competition attracts more than 500 competitors who compete in 40 contest areas. The program was launched in 1994, and is the only national multi-trade and technology competition for young students and apprentices in the country. On Monday, Nov. 21, the Government of Canada and B.C. Government announced funding that will support the construction of a new 1,250 square-metre (13,450 square-foot) Trades Training Centre at Okanagan College's Vernon campus. The funding will help address a shortage of available trades training shops in the region by providing a purpose-built space at the Vernon campus. The new building, which will accommodate approximately 150 students, will include multipurpose trades shops and supporting space, a dedicated welding shop and multi-use trade space for the electrical, carpentry, plumbing and pipefitting programs, as well as Aboriginal and Women Trades Training programs. A massive investment is being made at Okanagan College in Vernon. The Kalamalka campus will be getting a new trades training centre. Currently, trades training is done in a leased space at the Vernon airport, but the federal and provincial governments are providing $6.21 million in funding for a new 1,250-square-metre (13,450-square-foot) Trades Training Centre tol be built on campus. The facility will also address a shortage of available trades training shops in the region. The new building will include multipurpose trades shops and supporting space, a dedicated welding shop and multi-use trade space for the electrical, carpentry, plumbing and pipefitting programs, as well as Aboriginal and women-in-trades training programs. Hamilton said it will make a big difference for students taking trades courses. “Students who are off site don't have immediate access to all of the other services that students on campus have – the library, the cafeteria, the gym, social events and all those sorts of things,” said Hamilton. For electrical student Harrison Coe being able to learn a trade on campus means a lot for accessibility. Construction is expected to get underway shortly with completion by spring 2018. The new building will be built to LEED Gold certification and construction is expected to create 25 direct and 13 indirect jobs for the region. Nearly one million job openings are expected in B.C. over the next decade, and eight out of 10 of these openings will require post-secondary education, according to an official release. Okanagan College Trades Building was named the Judges’ Choice Best Overall entry in the 8th Annual Southern Interior Construction Association Commercial Building Awards Thursday, Oct. 27 at the Four Points Sheraton Hotel. There were 28 finalists in the event, which had cities in the Thompson, Okanagan and Kootenay regions represented, with entries from Kamloops, Monte Creek, Salmon Arm, Sicamous, Enderby, Vernon, Lake Country, Kelowna, West Kelowna, Summerland, Penticton and Cranbrook. Re/MAX Commercial was a Gold sponsor of the event, with RBC Royal Bank, Coldwell Banker Horizon Realty, MNP LLP, Wood WORKS! BC and Green Sheet Review. New institutional, commercial, industrial building, multi/single family, recreational or renovation projects must have been completed between July 31, 2015 and July 31, 2016 were eligible. Each submission was judged by a team of independent judges. 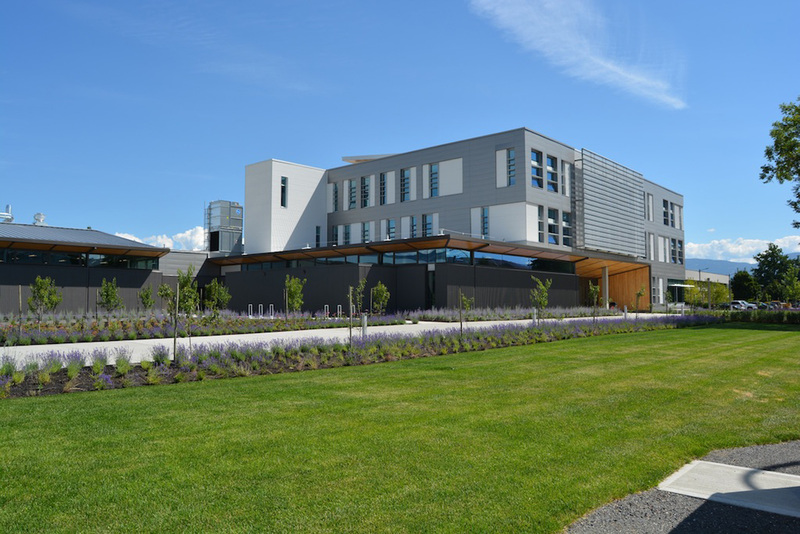 Okanagan College Trades Building was the Excellence Award winner in the Commercial Institutional category as well. General Contractor for the project was PCL Constructors Westcoast Inc., and Architect/Designe was Diamond Schmitt Architects Inc. Within days of stepping into the classroom, a group of Okanagan College trades students were stepping onto the jobsite, putting their newly acquired skills to work on a Habitat for Humanity home in the South Okanagan. Twelve students from the Construction Craft Worker Aboriginal Bridging (CCWAB) program recently spent two weeks contributing painting, trim, landscaping, and insulation to a single family home in Peachland. Students will gain hands-on training on a number of jobsites between now and December, including on the site of the new Westbank First Nation Youth Centre, where they assisted with the removal of a three-level scaffolding system on Oct. 3. Offered in collaboration with BC Hydro and Westbank First Nation, the program is tuition-free and includes work boots, bus passes, group study sessions, cultural activities, volunteer work experience and job search skills to remove potential barriers and support success. Click here for more information about the program. Trades Training so good, it's "Superboulous"
Darrick chose Okanagan College and the Construction Craft Worker Aboriginal program. Construction craft workers are part of almost every construction site. They are responsible for a range of duties at construction sites, including site preparation and cleanup, and assisting on concrete, masonry, steel and wood projects. He is working as a unionized, ticketed, construction craft worker in Winfield, “I love my work. I’m not just doing one thing all day.” Darrick’s new employer is impressed with his great attitude and willingness to learn, and believes the program has prepared him to handle work in several trades, including carpentry and plumbing. ShawTV - Okanagan recently visited Okanagan College’s Kelowna campus to film a video about the College’s successful Women inTrades Training Program (WITT); meanwhile The Summerland Review published a story onJune 2 about the WITT program and growing opportunities for women in the trades,including an interview with Program Administrator Nancy Darling. Twelve students from bands throughout B.C. and across Western Canada recently completed the first level of a unique collaborative apprenticeship program designed to support Aboriginal learners looking to advance their careers in the construction sector. In March 2015, Okanagan College launched a new Construction Craft Worker two-level apprenticeship program. Last November, the College created an intake tailored specifically for Aboriginal students. Photo Gallery - students placing concrete. “The College is committed to working with local bands, First Nations, and Métis across our region to create access and offer new training opportunities to meet the need for skilled workers among their members,” says Okanagan College President Jim Hamilton. Most of the students in the class are from the Westbank First Nation (WFN) and Adams Lake Indian Band (ALIB), with a few from bands and communities outside the region. "The College is committed to working with local bands, First Nations, and Métis across our region to create access and offer new training opportunities to meet the need for skilled workers among their members,” says Okanagan College President Jim Hamilton. In addition to the WFN and ALIB, the College partnered with agencies throughout the province to break down barriers for students. The Aboriginal Community Based Training Partnerships (ACBTP) Program provided tuition and books, tools, lunches, safety gear and transportation. CIBC provided motel accommodation and living support for out-of-town students. The bands, the Aboriginal Skills, Employment and Training Services (ASETS) and the Okanagan Training and Development Council (OTDC) provided meal allowances; OTDC also sponsored the apprentices. For Jay Darwin Charleyboy, a member of the Ulkatcho First Nation, completing Level 1 of the program achieved two goals. It brought him one step closer to his dream of becoming a Red Seal-certified tradesperson. It also gave the single father of three a chance to demonstrate to his daughters the importance of lifelong learning. Charleyboy said that the College’s respect toward Aboriginal culture was evident in the class. The program’s coordinator, Sara Cousins, also re-iterated the benefit of having an Aboriginal mentor on hand to work with the students. “An important part of the success of this program was the Aboriginal Classroom Mentor, Chezzeray Alphonse, who was with the students every day providing academic, personal and cultural support,” says Cousins. Alphonse is from Tl’etinqox, also near Williams Lake, and recently completed fourth year carpentry apprenticeship at Okanagan College. “Being a peer mentor is a great experience and to be able to give back to the college in any way is a great privilege,” says Alphonse. Construction Craft Workers play an important role on every job site in the province, from set-up to clean up. They install utility piping, place concrete, construct roads, perform underground work, and assist skilled tradespeople such as Carpenters, Bricklayers, Cement Finishers, and Heady Equipment Operators. The B.C. government has projected there will be call for nearly 12,000 construction trade workers by 2018. In the Okanagan, it is expected that the residential and commercial construction and road building sectors and related occupations will require 7,149 new skilled tradespeople. Construction Craft Worker Apprenticeship Level 2 is starting August 7, 2016 - contact our Apprenticeship Office.